English (ENG), Spanish (ES), French (FR), German (DE), Arabic (AR), and Turkish (TR) versions available to download. MSF created the Access Campaign in 1999 in response to the injustice we saw in our clinics where staff often didn’t have the tools to treat the people who came to us for medical care. Our first great challenge in the early 2000s was to support the battle to bring down the price of antiretroviral drugs for people living with HIV in developing countries. At the same time, we worked to ensure the development and use of artemisinin-based combination treatments to replace ineffective drugs like chloroquine for malaria, and promoted research and development for new treatments for sleeping sickness – leading to the creation of the Drugs for Neglected Diseases initiative (DNDi). Our work has continued to tackle the health inequality that allows some people to live but others to die according to their ability to pay. Today we are fighting against exorbitant prices of new medicines to cure hepatitis C, for shorter and more effective treatments for tuberculosis, and for affordable and effective treatments for snakebite. To give patients the best possible treatment, we also advocate to get better diagnostic tools developed, such as tests that can differentiate the causes of fever in sick patients or determine which drugs a patient with TB will respond to. As we tackle the burning access and innovation needs our teams face today, we also work to change the rules of the game around medical innovation, access and pricing, so we don’t have to fight the same battles again tomorrow. We hope you will be inspired by our work and we invite you to join us in our continued efforts to ensure that everyone – no matter where they live – can benefit from advances in modern science and medicine. 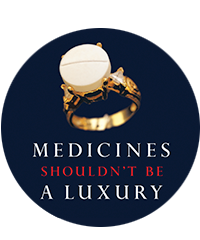 Because medicines shouldn’t be a luxury.